Ladies Fitted Tee - 100% Organic Cotton Tee is feather soft and purely organic, and oh, so easy to wear! Featuring a slim profile that won't feel bulky if you layer another tee on top, nor bunch under a sweater or jacket. Stellar quality; they keep their shape & size...Wash after wash after wash. High to Mid Hip Length. Slender Women's Sizing. Just plain GORGEOUS! Be sure to match these with our Pants - our cotton pants are a "natural" with these Tees. 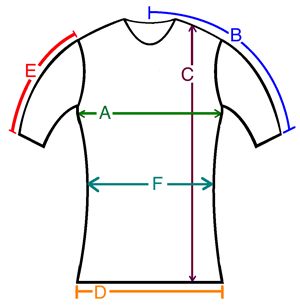 A: Chest / Bust circumference 36-37" 37-38" 41-42"
B: Sleeve length from center of neck to end of sleeve 13.5" 13.5" 14.5"
C: Body length from shoulder to bottom of hem 24" 25" 25"
D: Hem circumference 37" 39" 43"
E: Sleeve length from shoulder to end of sleeve 5.5" 5.5" 5.5"
F: Waist measured 14" below shoulder 33" 36" 41"